In order to build lean muscles, it is important to include strength training into your exercise routine. In addition to regular cardio exercise, two to three days a week of strength training will help to build lean muscle mass, which helps your body burn more calories. Resistance bands are a great way to work both lower and upper body muscles, along with core muscles. The American Council on Exercise recommends a full body workout with a resistance band. The routine as recommended includes leg abduction, hamstring curl, bicep curl, squat, chest press, upper-back press, lateral raise, triceps extension, lateral pull-down, back extension and reverse crunch. The workout, which encompasses 12 exercises and a recommended 20 reps per move, takes approximately 20 minutes to complete. Performing the whole-body workout just twice a week is enough to build and maintain muscular strength and endurance. Make sure to follow the directions and concentrate on performing each one in a slow and controlled manner because proper form is essential. 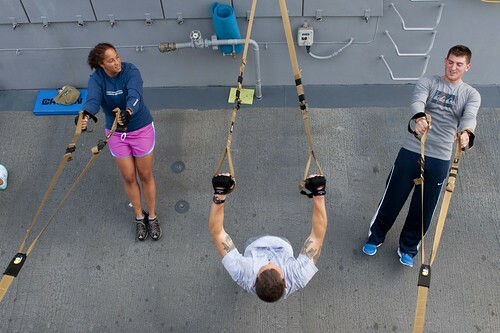 After the exercises begin to feel too easy, you can graduate to a band with greater resistance. There are many benefits of using resistance bands compared to other weights and workout machines. First, resistance bands require no storage space and can be hung up after use. This makes exercise bands the perfect workout regimen for traveling. Not only are exercise bands portable and easy to use, they are extremely effective for developing muscular strength and endurance. Additionally, resistance bands add new excitement into traditional workout routines that have become boring. They are also typically safer than other weight equipment because you aren’t at risk of dropping a weight on your foot. To get started, try out these five moves that target arms, back, legs, buttocks and shoulders. The high-speed workout will help you tone up in less than 15 minutes per day. Make sure to do 3 sets of each move. Triceps Push-Up– Start in a modified push-up position (back straight, abs engaged, knees and lower legs on mat). Place resistance band across back and hold end tightly under each hand. Place hands about 5 inches apart on mat and lower chest toward floor, making sure to keep elbows by sides. Push back up into band and hold for 4 seconds. Do 10 reps.
Lat Raise Combo– Stand with feet shoulder-width apart and staggered, with your right foot forward and left back. Place band under left food and hold in left hand. Hinge forward from hips at a 45 degree angle, making sure to keep back straight and right palm on right thigh. Raise band to shoulder height in front of you, palm facing floor and hold for 2 counts. Bend elbow out to side and hold, then lower. Do 12 reps. Switch sides and repeat 12 more reps.
Skater Squats– Stand on top of band with feet shoulder-width apart, knees slightly bent, holding an end in each hand. Step out to the right, pushing foot against band. Squat, keeping knees behind toes. Hold for two counts, then step back to starting position. Do 16 reps, then switch sides and repeat. X Wrap– Sit on floor with legs in a V position. Wrap band over quads and under hamstrings, forming an X, and hold an end in each hand. Engage abs, keeping backs straight and chest lifted, and raise legs about 1 foot off the floor. Pull on band as you push legs out to sides, then back in. Do 15 reps, making sure to not lower legs. Pelvic Push– Lie face-up with knees bent, heels shoulder-width apart on floor and feet flexed. Squeeze glutes and lift hips into bridge. Drape band over hips and pull hands to floor so band is tight to body. Lower and lift hips 15 times while keeping arms still. What is your favorite full-body workout? Have you tried incorporating resistance bands into your strength training regimen?